An account profile is created for the purpose of data collection and customer identification (during a support call). An account profile does NOT correspond to an account login. For a specific hosting account, there is only one account login (username and password), but there could be multiple account profiles. If you call customer support, and you are not the account owner, your information should be set up in your account profile. An account profile describes a person with access to your account, such as the site owner, administrator or Webmaster. We collect your contact information, information about your technical environment, experience, and interests. We then use this information to keep you informed about your account, changes to our systems, and any new or special offers that might be of interest to you. Scroll down to Account Information, and click Change Account Info. You are on the Account Information page. Account Information is broken up into two parts. The basic account information, such as the default account email, telephone number, etc. is on the left. On the right is a list of all additional account users. Your account information includes the basics of your account, such as the telephone number, email, address, etc. associated with your account, plus similar information associated with any registered users of your account. Any registered user of your account can modify account information. Scroll down to the Account Info section in the right sidebar and click Change Account Info. Click Edit under the left side Account Information section. The right side of the Account Information page lists all users registered on your account. To delete a user listed on this page, click Delete next to the user's name. The right side of the Account Information page lists all users registered on your account. To edit a user's information, click Edit next to the user's name. A form with user information is displayed. Edit the fields you wish to change. 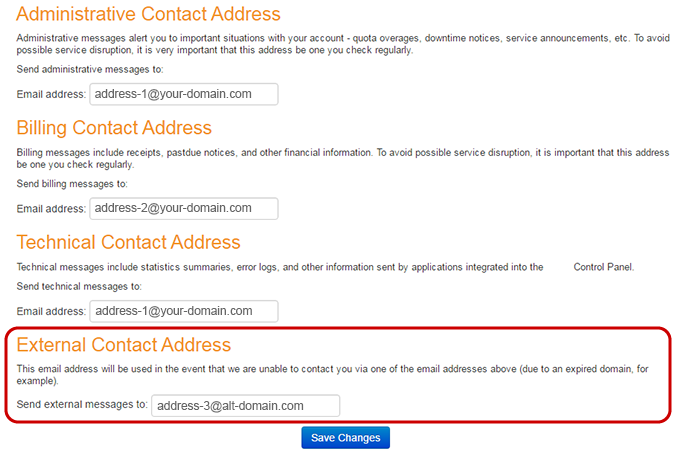 It is important that you have a contact email address that is not affiliated with your domain(s). In the event your hosting or domain service is disrupted we will be able to contact your through this external email address, i.e. Gmail, Yahoo or HotMail. If you're not satisfied with EntryHost, we'll give you your money back. No questions asked. During the first 30 days, we'll refund your hosting fees in full. Still, if you try us and decide that EntryHost just isn't for you, we think you should get your money back. If you register a domain through EntryHost, please note there is a non-refundable $15 domain fee. This fee not only covers our own costs, but it ensures that, even if you're dissatisfied with your experience at EntryHost, you won't lose your domain name. You'll be free to transfer it or simply point it elsewhere.